Color Typically yellow, brown or gray to colorless. Less often in blue, green, black, translucent white, pink, violet, orange, purple and red. Ultraviolet fluorescence colorless to yellowish stones - inert to strong in long wave, and typically blue. Weaker in short wave. Absorption spectra In pale yellow stones a 415.5 nm line is typical. 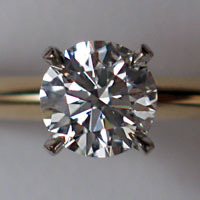 Irradiated and annealed diamonds often show a line around 594 nm when cooled to low temperatures. A blue diamond recently fetched nearly $8 million. The blue hue was a result of trace amounts of boron in the stone's crystal structure. Diamond production of primary deposits (kimberlites and lamproites) only started in the 1870's after the discovery of the Diamond fields in South Africa. Production has increased over time and now an accumulated total of 4.5 billion carats have been mined since that date. Interestingly 20% of that amount has been mined in the last 5 years alone and during the last ten years, 9 new mines have started production while 4 more are awaiting opening soon. Most of these mines are located in Canada, Zimbabwe, Angola, and one in Russia. The Canadian Government has setup a body known as Canadian Diamond Code of Conduct: () to help authenticate Canadian Diamonds. This is a very stringent tracking system of diamonds and helps protect the 'conflict free' label of Canadian diamonds. The majority of commercially available synthetic diamonds are yellow in color and produced by so called High Pressure High Temperature (HPHT) processes. The yellow color is caused by Nitrogen impurities. Other colors may also be reproduced such as blue, green or pink which are a result of the addition of Boron or from irradiation after synthetisation. Currently, trained gemologists can also distinguish between natural diamonds from synthetic diamonds. Although it has been claimed that synthetic diamonds are so perfect that it is virtually impossible to distinguish them from natural diamonds, this is not the case. Depending on the type of diamonds (either HPHT produced or CVD produced) and the color of the diamond (colored, D-Z color range or D-J color range) several methods of identification are at the disposal of a gemologist or gemlab: CVD diamonds can be identified through their orange fluorescence, D-J colored diamonds can be screened through the Swiss Gemological Organization's (SSEF) Diamond Spotter and stones in the D-Z color range can be identified through the DiamondSure UV/visible spectrometer which is a tool developed by De Beers. Currently, trained gemologists with appropriate equipment are able to distinguish natural diamonds from simulant diamonds, and they can identify all enhanced natural diamonds. 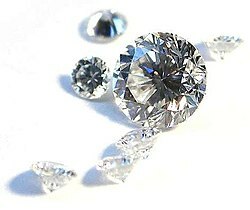 Coatings are more and more used to give a diamond simulant such as Cubic Zirconia a more "Diamond like" appearance. One such substance, which is heavily advertised, is what scientists refer to as "diamond-like carbon". This is an amorphous carbonaceous material that has some physical properties which are similar to that of the diamond. Advertising suggests (righfully so or not) that such a coating would transfer some of these diamond-like properties to the coated stone, hence enhancing the diamond simulant. However, modern techniques such as Raman Spectroscopy should easily identify such as treatment. ^ Yarnell, Amanda (2004). "The Many Facets of Man-Made Diamonds". Chemical and Engineering News 82 (5): 26–31. American Chemical Society. ISSN 0009-2347. Retrieved on 2006-10-03. ^ Pliny the Elder. Natural History: A Selection. Penguin Classics, p. 371. ISBN 0140444130. ^ "Chinese made first use of diamond", BBC News, 17 May 2005. Retrieved on 2007-03-21. ^ Taylor, W.R., Lynton A.J. & Ridd, M. (1990). "Nitrogen defect aggregation of some Australasian diamonds: Time-temperature constraints on the source regions of pipe and alluvial diamonds" (PDF). American Mineralogist 75: pp. 1290–1310. ^ Field, J E (1981). "Strength and Fracture Properties of Diamond". Philosophical Magazine A 43 (3): 595–618. Taylor and Francis Ltd. Retrieved on 2006-02-11. ^ M. Sevdermish and A. Mashiah (1995). The Dealer's Book of Gems and Diamonds. Kal Printing House, Israel. ^ Webster, Robert, and Read, Peter G. (Ed.) (2000). Gems: Their sources, descriptions and identification (5th ed. ), p. 17. Butterworth-Heinemann, Great Britain. ISBN 0-7506-1674-1. ^ Garai, J.; Haggerty, S.E. ; Rekhi, S.; Chance, M. (2006). "Infrared Absorption Investigations Confirm the Extraterrestrial Origin of Carbonado Diamonds". The Astrophysical Journal 653 (2): L153-L156. doi:10.1086/510451. ^ Diamonds from Outer Space: Geologists Discover Origin of Earth's Mysterious Black Diamonds. National Science Foundation (8 January 2007). Retrieved on 2007-10-28. ^ a b c Hershey MS PhD, Willard (1940). The Book of Diamonds. Hearthside Press New York. ^ a b Janse, A J A. "Global Rough Diamond Production Since 1870". Gems and Gemology XLIII (Summer 2007): 98-119. GIA date=2007. Retrieved on 2007-09-10. ^ a b Lorenz, V (2007). "Argyle in Western Australia: The world's richest diamondiferous pipe; its past and future". Gemmologie, Zeitschrift der Deutschen Gemmologischen Gesellschaft 56 (1/2): 35-40. DGemG. ^ Marshall, Stephen; Josh Shore (2004). The Diamond Life. Retrieved on 2007-03-21. ^ Joint Resolution - World Federation of Diamond Bourses (WFDB) and International Diamond Manufacturers Association. World Diamond Council (July 19, 2000). Retrieved on 2006-11-05. ^ Bourse listing. World Federation of Diamond Bourses. Retrieved on 2007-04-04. ^ The Nature of Diamonds: 5. Growing Diamonds. American Museum of Natural History. Retrieved on 2007-03-21. ^ Shigley et al., J E (2002). "Gemesis Laboratory Created Diamonds". Gems and Gemology 38 (4): 301–309. GIA. Retrieved on 2007-05-28. ^ Shigley et al., J E (2004). "Lab Grown Colored Diamonds from Chatham Created Gems". Gems and Gemology 40 (2): 128-145. GIA. Retrieved on 2007-05-28. ^ Welbourn, Christopher (2006). "Identification of Synthetic Diamonds: Present Status and Future Developments/Proceedings of the 4th International Gemological Symposium". Gems and Gemology 42 (3): 34-35. GIA. Retrieved on 2007-05-28. ^ Shigley, J E (Juni 2007). "Observations on new coated gemstones". Gemmologie: Zeitschrift der Deutschen Gemmologischen Gesellschaft 56 (1/2): 53-56. DGemG. Retrieved on 2007-08-07. Taylor, W.R., Lynton A.J. & Ridd, M., (1990) Nitrogen defect aggregation of some Australasian diamonds: Time-temperature constraints on the source regions of pipe and alluvial diamonds. American Mineralogist, 75, pp. 1290–1310. Historical Diamond Books/References, 5000 pages Most of the books mentioned as references, found online here. Four important factors that control a diamond's appearance and durability are often lumped together and called the Four Cs: diamond color, clarity, cut and carat weight. There are several ways to make a diamond appear larger than it actually is. A diamond's appearance can be enhanced by your choice of cut, shape, and setting. Created diamonds are becoming more common, but the stones produced by LifeGem are unique. Diamond is something superb, the peerless "king of gems" that glitters, dazzles, and symbolizes purity and strength. Diamond is for engagement and the 75th wedding anniversary, for a commitment to never-ending love. Diamond is exotic, formed in Earth's interior and shot to the surface by extraordinary volcanoes.